If you have blackheads it means that your skin is dirty- Myth. Blackheads are black or dark brown because the oil trapped beneath the pore has been exposed to air. Similar to how a banana turns brown once opened and left on the counter. You can read more about how to treat blackheads here. If you have oily skin you should wash your face more- Myth. If you over wash your face you strip your skin of it's natural oils and your skin will try to overcompensate by actually producing more oil. This can lead to more acne breakouts. Refined sugar causes wrinkles - Fact. This is actually a post all on it's own but refined sugar accelerates the aging of your skin which in turn causes loss of skin elasticity (firmness) and wrinkles. High quality tanning beds that only omit certain UV rays are okay every once in a while-Myth. Tanning beds are the WORST. Tanning beds can lead to premature aging of the skin, brown spots, wrinkles and skin cancer. 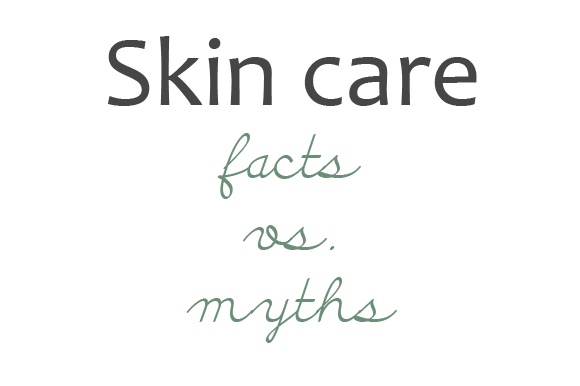 Is there anything else regarding skincare that you are wondering if it is a fact or myth? I would love to do a part two and include some of your questions. You always wonder what to believe or not to believe! I 've been hearing lately that dairy can cause acne...any truth to that? I only ask because in the past year my face has been at its worst and I do eat dairy like it is going out of style. Great info. And I didn't know that about refined sugar! Just another reason NOT to eat that stuff. And I think it's so funny that people think there is such a thing as 'safe' tanning. Damaging UV rays are damaging UV rays no matter if they came from the sun or a tanning bulb! Thanks for the info! Isn't it crazy all of the issues sugar causes!! Great information! I love your skincare tips! I've been trying to find a moisturizer for my face - any advice? I use Coconut Oil as my body moisturizer but that seems too "heavy" for my face. I'd love to know what you think about eye cream. Is it really necessary, or can I just use my moisturizer. Also, what are your favorite brands of wash/moisturizers? hey can u do some research and post anything to treat large pores!! :/ pleaseeee!!!! These are so great! Thanks for the information , friend! I have missed seeing your posts! So happy to keep up with you on instagram! Have a great week, Linds! Tanning beds are super dangerous! Years ago I got a mole from a tanning bed that grew cancerous cells and they had to do two outpatient surgeries to remove all the bad cells. Never ever use a tanning bed! I would love to learn more about the effect of refined sugars on the body. I have the same question as Jennifer regarding dairy (inflamation?) causing acne. I was also wondering if you recommend using the same line of product for all of a skin care routine or can one mix and match brands (for example, a homemade face wash/scrub, Clinique scar serum, Mary Kay blemish treatment, etc.) Thanks! I love your posts!!! answers please :) i'm curious about every one of these questions and trust you advice. thanks! I have heard mineral oil is bad for your skin why is that?? Should I avoid face products that have it? I have used extra birgin olive oil to wash my face. I saw on dr. Oz that it was good.. I have seen nothing but good come from it! I am very much careful about my skin as its very much sensitive, thanks for sharing this tips.